Media bias is not new. 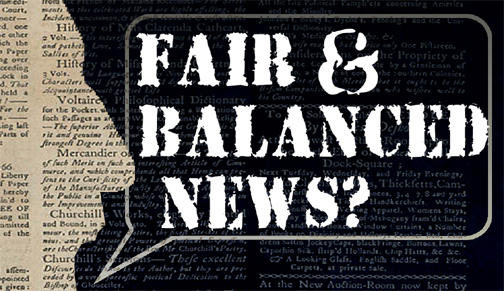 In fact, the idea that news reporting could be unbiased is really the relatively new idea in the history of journalism. Wars between news writers and politicians, between news writers and individuals, and between news writers and other news writers is an American tradition. And mixing what we would call editorials with standard news reporting was the expected practice in our country’s founding years. 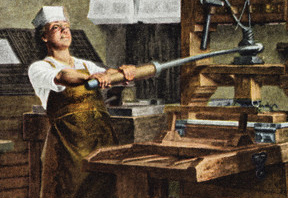 In the 1740’s & 50’s, when the United States was still the American Colonies, competition for customers drove a war of wit between Philadelphia printers. Three printers vying for readership were William Bradford, Samuel Keimer and Titan Leeds. Unfortunately for these three men, their opponent in this battle was Benjamin Franklin. In the battle of wits these men were carrying swords; Franklin brought a cannon. Franklin was actually working for printer Samuel Keimer in Philadelphia when he began writing gossipy letters under the pseudonym Busy-Body and sending them to Philadelphia’s most successful and oldest established printer, William Bradford. Bradford knew good material when he saw it and published these funny, slightly scandalous letters in his paper. They quickly became very popular reads. As Busy-Body, Franklin wrote scathing things about the inferior Keimer and his newspaper, which caused Keimer’s readership to drop. The frustrated Keimer sold his now undervalued newspaper to Franklin at a low price, and Franklin found himself in competition with Bradford. Now Franklin wrote witty letters for his own paper attacking Bradford, still under various pseudonyms. Soon Franklin’s readership was climbing steadily, and readers that had purchased Bradford’s paper subscribed to Franklin’s. Poor Titian Leeds was a publisher of almanacs who found himself being ridiculed in Poor Richard’s Almanac. Richard Saunders (Poor Richard) was another character from Franklin’s imagination. When Poor Richard made his annual predictions, he included the predicted date of his competitor Titian Leeds’ death in the coming year. Leeds protested in his next publication that he had not died on the predicted day but to no avail. Saunders (Franklin) just theorized that the real Leeds had died and someone else probably assumed his name and business. Think about that, not only claiming your competition died but accusing him of identity theft for stealing his own name! Franklin, as Saunders, continued to insist that Leeds had died until four years later, when Leeds did die. Then Franklin congratulated the man who had assumed Leeds’ name for finally admitting the deception. 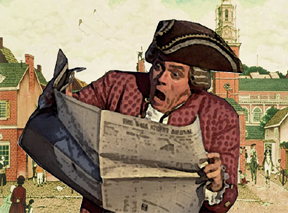 During the Revolutionary War, Tory (British Loyalist) newspapers often covered the same news as the Patriot newspapers, with a completely different slant. The Loyalists would call any action by the Patriots a “mob” or acts of “the violent party.” One pamphlet even declared the reason that the Continental Congress signed the Suffolk Resolves was because they “came into this vote immediately after drinking thirty-two bumpers of Madeira (wine).” The Patriots were no slouches at propagandizing their point of view either; we still call the events in Boston of March 5, 1770 a “massacre” because smart Sons of Liberty named it that way. Terms like “intolerable acts,” “abject slavery” and “enemies of liberty” were much better choices for promoting the glorious cause than The Massachusetts Government Act, compliance with the law and ministerial troops. Which, by the way, are the same things as described by Tory papers. “Our liberty depends on the freedom of the press, and that cannot be limited without being lost." It’s easy to say that Jefferson changed his mind or was being hypocritical, but you don’t have to be a revolutionary Virginia lawyer turned politician to see that both those statements can be true. Newspapers savaged our first three Presidents. President George Washington was accused of having colluded with the British during the Revolution and selling America to the British with the Jay Treaty. John Adams was accused of being a mad Monarchist with aspirations for his own crown. Thomas Jefferson was accused of being an enemy of the Constitution, overinflating his expenses while an ambassador in France and being a sexual deviant. In response Washington endured the barbs of the press until his resignation, Adams signed the unconstitutional (and rather Monarchal) Alien and Sedition act, which jailed Presidential critics, and Jefferson underwrote sympathetic newspapers, becoming a master media manipulator. What is really hard for us to imagine today is the level of interrelationship that existed between the Government, the political parties of the early Republic and the newspapers themselves. During Washington’s administration, John Fenno’s United States Gazette was a completely pro-Federalist publication that would print whatever truth or lies he felt would forward the party agenda. The Democratic republican newspaper the National Gazette was the work of Phillip Freneau, using similar questionable practices to criticize all things Federalist. While Jefferson was still Secretary of State under Washington he was encouraging Freneau, giving him financial encouragement and even providing him a job in his state department. At the same time, staunch Federalist Alexander Hamilton, Secretary of The Treasury, was supplying Fenno’s Gazette with anti-Jefferson letters, information, and money. We cannot talk about early news reporting without giving the Alien and Sedition Act serious discussion. Benjamin Franklin’s grandson, Benjamin Franklin Bache, printed his own paper The Philadelphia Aurora. In the paper he published letters written by George Washington at Valley Forge that purported to show he was really a British sympathizer. The letters were forgeries, but Bache refused to disavow them or print a retraction. Passed largely in response to this case, the Alien and Sedition Act claimed to protect the United States from alien citizens and powers and to stop seditious attacks from weakening the government. Sedition was defined by the Act as publishing "false, scandalous, and malicious writing" against the government or its officials. Of course, any criticism of any government official can be considered scandalous or malicious. The act was clearly a violation of 1st Amendment rights of free speech and free press as well as the 10th amendment. After it was signed into law by John Adams, Bache was arrested, though he died of illness before he could stand trial. Public outrage over the Act soon made it an election issue, and Adams was voted out in 1800. After Jefferson took office, he pardoned everyone who had been convicted under the law, and later allowed the act to expire. Those that work in journalism will always choose what is published, printed and reported, but we are a free people. It is our responsibility, as it ever was, to choose to whom and what we listen.